One cannot imagine an ocean more still and silent than that which we experienced today. We took advantage of the calm seas to clean the ship and air out the space below decks. Several of us jumped overboard late this morning to enjoy a refreshing bath. Given the lack of wind, there was no chance that the ship would sail away without us. The water was wonderfully clear so we swam under the ship to inspect the hull and rudder. It was a peculiar thrill to swim in water that was 3,000 meters deep. We couldn’t help but wonder what creatures might be swimming in the blue depths beneath us. Back on board, we set ourselves to a variety of tasks. First Mate Khamis instructed the crew on how to use the emergency flares. 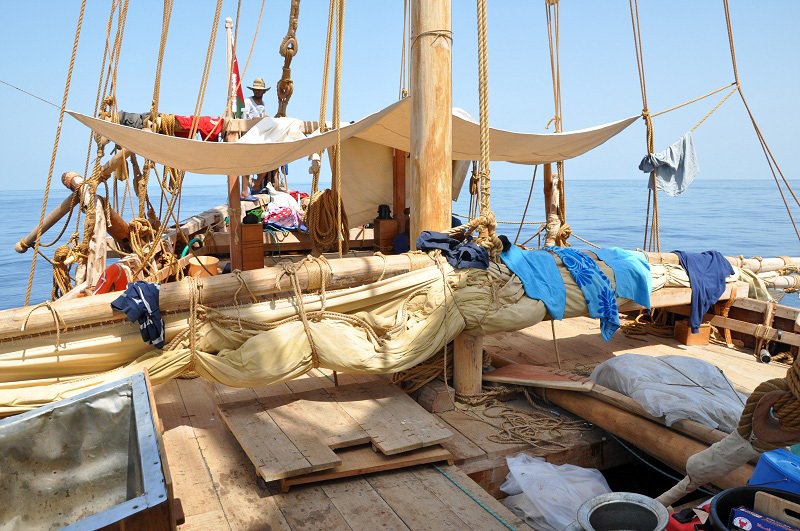 Several of the crew continued to tie “baggy wrinkles”–the shaggy knotted cordage which we attach to the mainstays to prevent them from chafing against the sails. Toward late afternoon, Said Al Tarshi, Yahya Al Faraji and Fahad Al Shaibi decided to liven things up by getting out the drums and engaging everyone in some traditional Omani songs and dances. It was great fun and a pleasant way to end the day. It is now 2300 and only moments ago a pod of dolphins passed along our port side. We heard the sound of their breathing before we could actually see them. They undulated across the glassy water as they swam off behind us toward their mysterious destination–their dorsal fins silhouetted against the silver reflection of the moon upon the sea. We have had many such magical moments thus far on the voyage. Two nights ago, for example, the bio-luminescence was brighter and more pervasive than I have ever witnessed, creating brilliant specks of light on the surface of the water as far as one could see. The moon had already set, allowing the heavens to display their full magnificence, and the sensation for those of us on watch was that of sailing through outer space with stars above and below our ship. As we end our watch and head to our bunks, we are hopeful that by morning a fair wind will fill the sails of the Jewel of Muscat and bring her ever closer to India.